Five new hires, a crazy boss, and a sidekick who may not even be human. The job? Well, it depends on who’s asking. WORKFORCE is an original comedy featuring a wildly talented bunch of men and women (and one teen) of mixed physical abilities, many of whom will appear on the stage for the first time ever! Preparing this play has been a wild ride for all of us--and we're excited to show you what we've achieved after months of challenging rehearsals, not to mention the challenge of trying to catch mobility service on schedule! Anima is an exhibition featuring nine students and recent graduates of Towson University. Their works explore various roles and identities through the lens of distorted bodies. Come hang out and meet the artists at the opening reception on Saturday, August 15th from 6-9pm. Hours: Wednesdays - Saturdays noon - 4 pm or by appt. Parking: Plenty of street parking and garages around Towson. reception Saturday, July 11 6-8pm at the TAC EBC Arts Center on 40 W.
Chesapeake Avenue in Towson. Parking is free after 6pm on the street. Celebrate Towson ARTS Collective’s 8th Anniversary Members Exhibition! The Towson Arts Collective presents Meridian: Towson University’s Senior Exhibition. This exhibit will run from May 9 through May 21, 2015. Meet the artists at the reception from 6-9pm on Saturday, May 9, 2015, at the street level EBC Arts Center at 40 West Chesapeake Avenue, Towson MD 21204. The gallery will be open Wednesdays - Saturdays from 12pm - 5pm. All artists featured are students or graduating seniors of Towson University. Featured works are in a variety of media, including photography, graphic design, painting, drawing, illustration, 3D art, and digital art. 60+ Student artists are featured in this exhibition. Brianna Pleasant (bpleas1@students.towson.edu) or Nick Miles (nmiles@comcast.net). On Saturday, May 9 and Sunday, May 10 the Cromwell Valley Park Council and the Towson Arts Collective are hosting the Cromwell Valley Arts Festival. The festival runs from 10 a.m. to 5 p.m. on Saturday and 12 p.m. to 5 p.m. on Sunday. The Cromwell Valley Arts Festival features fine art, music, and literature. Children can enjoy a variety of fun activities, and adults can enjoy the local wines and craft beers. Vendors will be available selling art-related merchandise as well as food. Arts at the Cromwell Valley Arts Festival includes pottery, metalworking, small press books, jewelry design, fiber design, woodworking, mixed media, photography, drawing, painting, and glassworking. Like Artscape, the festival is a great introduction (or inspiration for seasoned art lovers) for Baltimore families to the world of art. Admission is free, but a $5.00 donation for each car is greatly appreciated. No pre-registration is required. Towson Arts Collective presents the works of Towson University's Art Education Students. 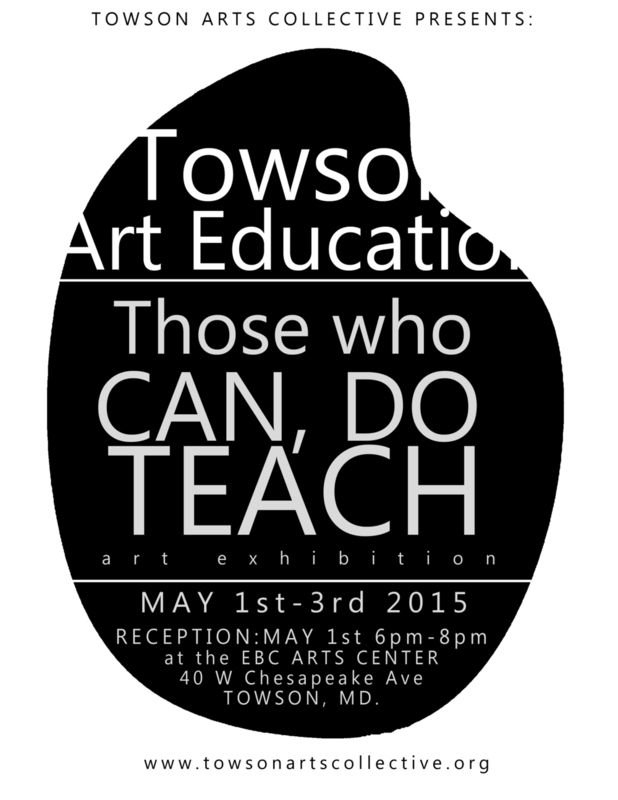 This exhibit will run from May 1-3 at the EBC Arts Center at 40 West Chesapeake Ave in Towson. Reception will be on May 1st from 6pm-8pm. For this exhibition, writers and visual artists are encouraged to submit both written and figurative work that deals with literature and the literary arts in some form. This might take the form of written/spoken works, collaborations between visual and literary artists, or visual works inspired by language and literature. As part of the exhibition, we are seeking writers to participate in a night of readings on Saturday, April 11, from 7-9:30/10 pm, as a showcase for the variety of literary artists in the area. Work can be in a variety of 2D or 3D mediums, including handmade books or book-like works. Students are encouraged to submit for this exhibition and readings. The Towson Arts Collective's EBC Arts Center will again bring bluegrass to the heart of Towson on Friday, April 10th when Fried Pickin, Andy Belt & Friends and the Bald Mountain Band join forces to bring you a night of foot-stomping good times. Please note that the YAS reception has been rescheduled due to inclement weather. Reception: Fri., March 13th 6 to 8 p.m.; Awards Presentation, 7p.m. Artists' work deals with the idea of the electronic, including physics of light and sound, and relationships with the mechanical and electrical realms of science and technology. Mediums include 2D, 3D, sound, music, video, projections, performance, light, circuits, optics, robotics, cameras, computers, mobile devices, sensors, transistors, diodes, or capacitors. A broad definition of the theme and the metaphoric possibilities for connection between humans and the devices they create and use are explored. This workshop is full! Thank you for your interest. Description: The workshop will involve creating a small work 8”x8” incorporating collage, assemblage and stitch. Participants can bring a photograph of their choice if they wish as source of inspiration. The image will be manipulated and transformed using composition, stitch and collage. Materials will be supplied however, participants can bring their own materials if they so wish. Join us for an incredible evening of Americana Music with performances by Andy Belt and Friends, The Old Part of Town and The Cousin Brothers. "While the circle is the simplest of geometric forms and its shape is familiar, it can become infinitely varied, subtle and enchanting when seen from unfamiliar and unique viewpoints,. Three photographers, Norm Dubin, Howard Greenberg, and Steve Hargrove, celebrate these surprising complexities and delights as they explore curved and circular patterns in Wheels, Whorls, Whirls." The exhibition, Mind’s Eye, explores the subjective realities and internal environments created by nine local visual artists showcasing their works in the areas of Painting, Drawing, Printmaking, Photography and Illustration. Opening Reception: Friday, August 15th from 7-9PM at Towson Arts Collective. Food, drinks, and a raffle for a chance to win a photo print by the artist of your choice! We still have a few tickets left for purchase at the door. ALL TICKETS WILL BE HELD AT WILL CALL. PLEASE BRING A VALID ID TO VERIFY YOUR TICKET PURCHASES. ALL TICKET SALES ARE FINAL and NON- REFUNDABLE. Towson Arts Collective is proud to announce A Night of Americana Benefit Concert on April 5th, 2014 from 7pm-12am. Proceeds from this benefit will directly fund artists with disabilities to learn, create and exhibit in the EBC Arts Center alongside artists without disabilities. The EBC Arts Center is an all inclusive arts education center and gallery that is located on 40 West Chesapeake Ave. in the heart of Towson, Maryland. Please join us for an incredible night of Americana Music with special guests the Mud Brothers, Andy Belt and Friends and The Highland Hill Boys. We thank you for Supporting the Arts!!!!! Just Kids is excited to premiere our original documentary, The Truth About Our Youth, across Maryland! The series of red carpet premiere events will include food and a panel discussion with experts in juvenile justice. Introduction to oils, mediums, and materials. Students will be emailed a supply list after registration is complete. Update: On Friday March 21st, Tango Class will not be held. Tango Class will resume on March 28. After March 28th, Tango will be on break until May 2nd. Tango Classes will be held at the EBC Arts Center every Friday 7:30pm- 9:30pm. $12 per person and $8 per student with school ID. Reception: Fri., Mar. 7, 6 to 8 p.m.; Awards Presentation, 7p.m. The Timonium Optimist Club joins forces with the Towson ARTS Collective to recognize and encourage talented young artists through an exhibit/competition that crosses school districts. Original, two-dimensional works of art are submitted by high schools – public, parochial or independent – in Baltimore City and Baltimore County. Prizes are awarded in the categories of Photography, Drawing/Graphics and Painting/Mixed Media. All entries are featured in a three-week public exhibit at the TAC gallery in Towson. Towson Arts Collective presents the “Move” exhibition: A celebration of the human figure in motion Feb 1st-28th. We invite you to join us for the “Move” reception on Feb 1st from 6pm-8pm at the EBC Arts Center located at 40 West Chesapeake Avenue. We will also have live Tango demonstrations by Luigi Rognoni. For more information about Luigi Rognoni click here.